“And these are the judgements which you shall set before them…” These are the rules concerning reincarnation, the judgement of souls that are sentenced according to their acts. 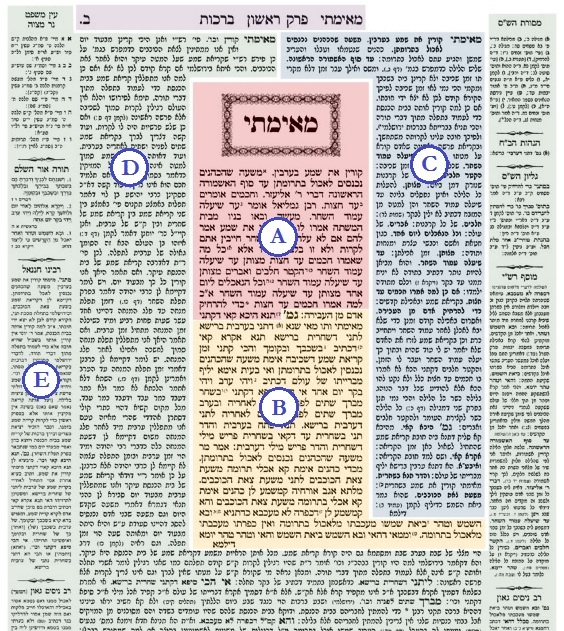 While the Zohar speaks at length about reincarnation, it is the Arizal who systematically laid down the rules of reincarnation and explained the Zohar in depth. 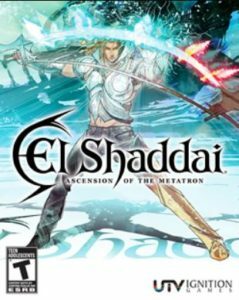 His primary disciple, Rabbi Chaim Vital, recorded these teachings in a famous treatise known as Sha’ar HaGilgulim, “Gate of Reincarnation”. 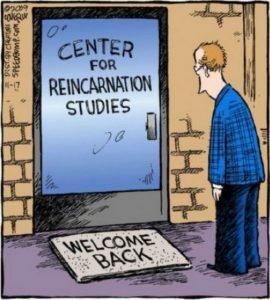 The following is a brief condensation of the basic rules of reincarnation that are defined in this tremendous text, answering many of the common questions people have about spiritual transmigration. Why do people reincarnate? Know that souls reincarnate for several reasons: The first is that one transgressed one of the prohibitions in the Torah, and returns to repair it. The second is to fulfil a mitzvah that one lacks. The third is in order to assist others, to guide them, and rectify them… Sometimes one reincarnates to marry their soulmate, which they did not merit to do in a previous life. The Ari explains that people mainly reincarnate in order to atone for sins of past lives, or to fulfil mitzvahs that they didn’t do previously. Later, in Chapter 16, we read that people who return do not have to fulfil all the mitzvahs in one lifetime, but only have to accomplish those that their souls are still lacking. Some reincarnate not for their own rectification, but to assist others. We are told elsewhere that these are usually very righteous individuals who agree to return to this world in order to help others. Some also reincarnate because they either did not marry, or married the wrong person. They must return to reunite with their true soulmate. The Arizal teaches that, unfortunately, some people are so deeply mired in kelipot, negative spiritual “husks”, that they are unable to find their soulmate in this world. These people will reunite with their other half only in Olam HaBa, the “next world” at the time of the Resurrection. With regards to finding soulmates, this is directed particularly at male souls, for it is primarily a man’s responsibility to find his soulmate. On that note, the following chapter tells us that female souls actually reincarnate very rarely. To begin with, female souls are more refined than male ones, and are unlikely to require more rectifications. What does happen more commonly is that male souls are reincarnated into female bodies! This opens up a number of fascinating scenarios which Rabbi Chaim Vital describes. What Do People Reincarnate Into? It is important to mention, though, that an entire human soul does not fully reincarnate into another organism. Rather, souls are complex entities made up of many different interacting sparks. It is only those sparks that require rectification that return to this world (Chapter 14). Interestingly, the Arizal teaches that when two people really dislike each other, and are constantly in conflict with one another, this is often because the two are sharing sparks from one soul! How Many Times May One Reincarnate? Sha’ar HaGilgulim records that a person can reincarnate thousands of times—but only on the condition that they improve at least a little bit in each incarnation. If they fail to improve, they can only reincarnate a maximum of three times. After three strikes, that particular spark is sent to Gehinnom (loosely translated as “hell”) where it will be purified. However, the souls of those who regularly learn Torah are never sent to Gehinnom, and always merit reincarnation. This is one of the incredible protective powers of regular Torah study. In multiple places, the Arizal teaches about the reincarnations of Abel, the son of Adam. Abel (הבל) had a good side and a bad one. The good side was represented by the letter Hei (ה) of his name, and the bad by the Beit and Lamed (בל). The bad part needed to be rectified, so it reincarnated in Laban (לבן), the wicked father-in-law of Jacob. Laban didn’t do much better, so he was reincarnated in the gentile prophet Bilaam (בלעם). 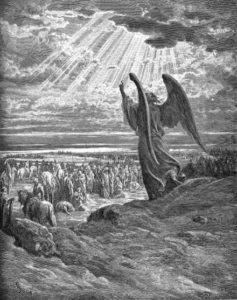 He, too, was an ungodly person, so the Beit-Lamed soul was reincarnated for the third time in Naval (נבל), the ungrateful man who rejected David. Naval was strike three, and that Beit-Lamed soul no longer returned in a reincarnation. We see from the above how a person’s name may offer tremendous hints as to their soul sparks, previous lives, tests, challenges, and character traits. When we read about the above individuals in the Tanakh, we see how similar they were. All three were very wealthy, famous, and participated in divination and sorcery. All were cunning, greedy, and deceitful individuals. 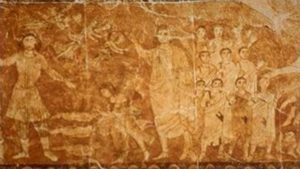 The Arizal explains in detail what rectifications each was supposed to do, and how one life affected the next, weaving together these three seemingly unrelated Biblical narratives that span nearly a thousand years into one beautiful tapestry. Which Body Will A Person Have at the End? And with each and every soul, when the time of the Resurrection comes, each and every body will take its corresponding soul, according to the part that it had at that particular time. Thus, each part of the soul will have its own body, and all reincarnations will exist simultaneously as individuals in Olam HaBa! In Chapter 23, Rabbi Vital suggests that the most important thing to take from all of this is to live a meaningful, spiritual life. When a person is mired in materialism, and cares only for their physical aspects, they become so attached to their bodies that they cannot exist without one. And so, when that person’s body dies their soul is in complete disarray; frightened, pained, and unable to ascend onwards. Angels must come and quickly place the soul in a new body. As such, this person can never free themselves from endless reincarnations into this imperfect, difficult world. However, those who in their lifetimes tap into their souls, and are comfortable with their spiritual side, are able to simply take off their dead bodies like an old garment, and move on. For such people, their wonderful portion in Olam HaBa is not too far away. This entry was posted in Jewish Law & Life Cycle and tagged Abel, Adam and Eve, Afterlife, Animals, Arizal, Bilaam, Chessed, Deborah, Gehinnom, Gevurah, Gilgul, Hod, Kelipot, Laban, Materialism, Middot, Mind-Body Connection, Mishpatim (parasha), Mitzvah, Names, Naval, Netzach, Olam HaBa, Rabbi Chaim Vital, Reincarnation, Resurrection, Sha'ar HaGilgulim, Soul, Soulmates, Souls of Tzadikim, Sparks, Spirituality, Tiferet, Tikkun, World to Come, Yesod, Zohar on February 23, 2017 by Efraim Palvanov. This week’s Torah reading is Mishpatim, literally “ordinances”, which is primarily composed of legal matters, as its name suggests. One of the most famous Torah phrases is found in this parasha: “you shall give a life for a life, an eye for an eye, a tooth for a tooth…” (Exodus 21:23-24). In legal terms, this is known by the Latin lex talionis, the law of retaliation. Most people are well aware of the fact that in Judaism, this verse was never taken literally. It does not mean that if one person poked out the eye of another, then his eye gets poked out in turn. A simple example: what if the person doing the poking out is blind? Then poking out his eye in retaliation wouldn’t accomplish anything! And so, Jewish law is unequivocal on the fact that the Torah verse simply means that the punishment should fit the crime. In most cases, the punishment comes in the form of appropriate monetary compensation. The compensation should include medical expenses, lost wages, and the costs for the damages, both physical and emotional. The Vilna Gaon had a beautiful way of proving that the Torah never meant retaliation, but financial remuneration instead. In Hebrew, the verse literally says “an eye under an eye” (ayin tachat ayin). The word for eye is עין, where the first letter is “under” (ie. alphabetically before) the letter פ, the second letter is under the letter כ, and the final letter is under ס. The letters above spell כסף, literally “money”. Thus, when the Torah says an eye under an eye, it secretly hints to monetary compensation. In Roman law, as well, lex talionis referred to financial compensation, and not direct retaliation. However, a more ancient legal system – one that predates both Roman law, and even Jewish law – did indeed use this principle literally. In fact, this legal system phrases the law in a very similar way. 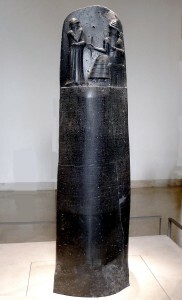 Stele of Hammurabi’s Code, currently housed at the Louvre in Paris. 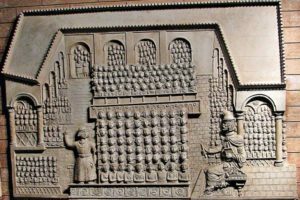 The top of the stele depicts Hammurabi receiving the laws from his patron god, Marduk. Hammurabi’s code is perhaps the earliest known legal system. 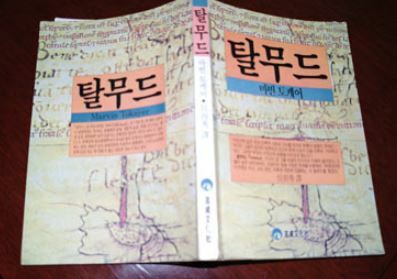 In fact, it is one of the oldest pieces of text ever discovered. Incredibly, archaeologists have also uncovered a multitude of tablets and writings from his reign, including as many as 55 of his own letters. And Hammurabi’s greatness goes far beyond these writings. Though initially his reign was peaceful, Hammurabi was soon mired in various wars by the aggression of neighbouring city-states. Hammurabi came out on top, and by the end of his reign had unified all the city-states of Mesopotamia under the Babylonian banner. He transformed Babylon into a metropolis and temple-laden holy city, putting it on the map for eternity. 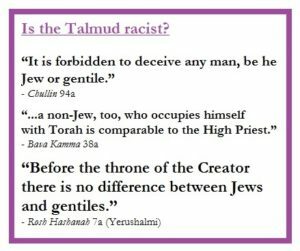 Thousands of years later, Jews still refer to the Talmud as the Bavli, the Babylonian (due to its composition in formerly-Babylonian lands, and to distinguish it from the lesser-known Yerushalmi Talmud). Of course, Babylon also made its way into the Torah. Before there is mention of any of our patriarchs, there is mention of the city of Babylon, with its Tower soaring to the Heavens, and drawing God’s wrath. And it appears that Hammurabi himself made it into the Holy Book. While “Hammurabi” is an Anglicized name, the king’s name was actually pronounced Ammurapi, or Ammuraphi. In Genesis 14 we read: “And it came to pass in the days of Amraphel, king of Shinar…” Shinar is the Biblical name for Mesopotamia (likely stemming from shnei naar, the land between the two rivers, which is the same as the Greek Mesopotamia). 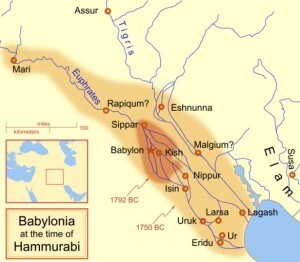 Meanwhile, Rashi comments that Amraphel was none other than Nimrod, the great king of Babylon. 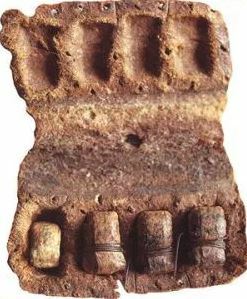 The tradition surrounding Nimrod is rich and varied. The Torah says he was a “great hunter before God” (Genesis 10:8) which some interpret to mean that he was a righteous, God-fearing man (Hammurabi’s stele also describes him as God-fearing). Others point out that his name Nimrod means “to rebel”, so he must have been the rebel who built the Tower of Babel in an attempt to conquer the Heavens. Whatever the case, after the Great Dispersion and the confounding of languages that followed the Tower, Nimrod became Amraphel. His exit from the Torah comes at the hands of Abraham, who miraculously defeated him in the War of the Kings. Though there is no way to say for sure that Hammurabi is Amraphel, or if he ever encountered Abraham, what we do know is that their lifespans certainly overlapped. The traditional Jewish dating for Abraham’s birth corresponds to the year 1812 BCE, while historical records suggest that Hammurabi was born around 1810 BCE. This entry was posted in Archaeology & History, Jewish Law & Life Cycle and tagged Abraham, Akkadian, Ammurapi, Amraphel, Anunnaki, Archaeology, Babylon, Code of Hammurabi, Eye for an Eye, Great Dispersion, Greek, Gustave Jéquier, Halakha, Hammurabi, History, Jewish Law, Lex Talionis, Marduk, Mesopotamia, Mishpatim (parasha), Mythology, Nimrod, Roman Law, Shinar, Susa, Tower of Babel, Vilna Gaon, War of the Kings on February 5, 2016 by Efraim Palvanov.